The Spanish contributions to the new world of capers, green olives, olive oil, bay (laurel) leaf and garlic combine to make this light and delicious dish. With slight variations the sauce can be used in a variety of Mexican entrees. Withhold the capers and green olives and you have a tasty sauce to pour over Chile Rellenos or use in a Huevos Rancheros breakfast dish. Any thin fish filet can be substituted for Red Snapper. In a large pot gently sauté garlic and onion in olive oil until clear not golden. Add chicken broth reserving 1/4 cup. Add tomatoes, bell pepper, capers, bay leaf, peppercorn and salt to taste. Mix corn starch with remaining 1/4 cup cold chicken broth. Add to vegatable mixture. Cover and let simmer 20 minutes. Add green olives. In a sauce pan season red snapper lightly with salt and place on lightly oiled sauce pan. Pour sauce over filet and cover, let simmer until fish is tender and flaky about 5 to 10 minutes. 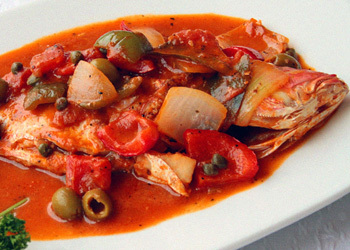 At Las Anitas we use a variety of fish filets in this traditional favorite.